The Rarest Skeleton in the World? Biggest, smallest, fastest, slowest, bravest, first, last and most venomous. It is not uncommon to come across animal specimens in natural history museums labelled according to their extreme qualities. Regardless of what Freud might have to say about this seeming obsession, drawing attention to the extremes of nature helps to capture the attention of visitors as well as create spectacle around specimens which are otherwise common. Unlike most other kinds of museums natural history museums tend to display the same kind of stuff. You’re almost guaranteed to see the exoskeleton of a Japanese spider crab, the skull and antlers of a giant deer, a taxidermy echidna and a cast of Archaeopteryx in every single natural history museum. Not only do these specimens helpfully illustrate the wonderful diversity of life but they also demonstrate extremes. The largest arthropod (well, largest leg span), largest antlers, weirdest mammal and ‘first’ bird. 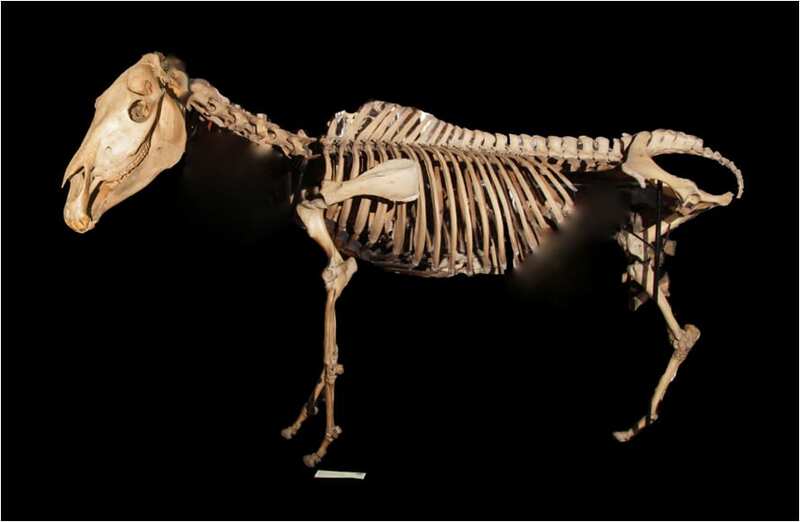 For example, the Grant Museum displays one of only seven Quagga skeletons known in the world, earning it the impressive title of rarest skeleton in the world. However, I’ve always had doubts about this claim which I hope to explore more with this post. A Quagga is an extinct subspecies of plains zebra which had a stripy front half and a plainer rear half. Sadly, the last wild individual died in the late 1870s and the last captive animal died in an Amsterdam zoo in 1883. Because of general confusion caused by naturalists trying to classify the numerous species and subspecies of zebra and the relatively quick extinction of the quagga in the wild due to hunting meant that not many specimens were preserved in museums. In fact, quaggas were once considered to be a separate species, their status as a subspecies only confirmed after their extinction using DNA extraction techniques. For many years the Grant Museum specimen was thought to be a plains zebra until Alan Gentry re-identified it as a quagga skeleton (Gentry 1972). There are only 23 known mounted and taxidermy specimens and, at the time of writing, only seven skeletons known. So these are the odds to beat, we have to find a rarer skeleton than that if we’re to take the quagga’s impressive title away from it. Of course, every skeleton is unique but this isn’t what we mean by rarest skeleton in the world, we actually mean, rarest skeleton representing a taxonomic group at or above the subspecies level however, this doesn’t exactly roll of the tongue. There are hundreds of examples for species which are known from only one skeleton, perhaps the most famous examples are dinosaurs. Compsognathus, Spinosaurus and even Tyrannosaurus rex are taxa described from only a handful of individuals and partial skeletons. However, here’s the important distinction – they are fossil skeletons not skeleton skeletons. I guess we should also discount those groups known from subfossils too and change our quagga’s title to rarest not fossilised skeleton representing a taxonomic group at or above the subspecies level. Can you see where we might be going with this? A ha! Says a keen-eyed reader, what about organisms like the dodo which are known from unfossilised remains which don’t even amount to a single complete skeleton from one individual? No complete specimen of a dodo exists, sadly the bird went extinct before even one whole skeleton was collected in a museum. Many composite skeletons have been reconstructed but mostly from subfossil material (see get-out clause number two above), the total remains of unfossilised dodo remains known amounts to a head, one skull, one foot, a beak tip, a leg and a dubious egg (Kallio 2004). Perhaps the title should be adjusted to mostly complete skeleton because the Grant Museum quagga is missing a leg and a shoulder blade. The skeleton has to be more there than not to be qualified. So, quaggas still come up top as the rarest not fossilised mostly complete skeleton representing a taxonomic group at or above the subspecies level. So who are the also-rans in his competition? The extinct Steller’s Sea Cow is known from around 20 skeletons. Interestingly, it seems that blue whale skeletons are relatively rare probably because they take up so much space but between North America and Canada there are six on display and I’ve seen the ones in Prague and at the Natural History Museum London making more than seven (phew). The fact of the matter is that even in this day and age it is hard to find out how many skeletons of various species museums hold. At least one mounted skeleton of Shepherd’s beaked whale is known, less than 30 individuals have ever been seen, wild or stranded. The beautifully named Dusky Flying Fox only exists from one specimen but whether this is a skeleton or not is unknown. The Red Gazelle is known from only two specimens but again, I haven’t been able to ascertain whether these specimens are mostly complete etc. etc. skeletons. The False Potto is known from a single skeleton! BUT currently remains a taxonomically dubious species. I don’t know if recently discovered species like Bosavi Woolly Rat have yet to be skeletised or if a specimen has even (or should be) collected. Which raises interesting questions about this line of enquiry. Long gone (perhaps?) are the days of ‘stamp collecting’, the unethical collecting of material for museums and my musings today have been inspired by looking at the statistical artifact of our poorly conceived hunt for the rarest skeleton already in a museum collection. Unethical museum collecting actually made the Great Auk extinct and it is impossible to quantify exactly how many species have been wiped out directly or indirectly by museums. This is why natural history museums have an extra responsibility to ensure that collected material is used to educate people about environmental conservation. Every ethical museum has a duty of care to each and every specimen it houses regardless of rarity and other perceived measures of value. As a last resort I even googled ‘only skeleton in the world’ but the first sensible result that came back was a link to this news story celebrating the 125th anniversary of the extinction of the quagga… at the Grant Museum, so I guess it must be true. Do feel free to add any contenders in the comments and also marvel at how difficult it is to find this information out and really, how little we truly know about the organisms that inhabit Earth. Until then the quagga remains the rarest not fossilised mostly complete skeleton represeting a valid taxonomic group at or above the subspecies level which is almost definitely extinct thus preventing the existence of other skeletons in ‘active use’. Gentry, Alan W. 1975 A Quagga, Equus quagga (Mammalia, Equidae) at University College, London and a note on a supposed Quagga in The City Museum, Bristol. Bulletin British Museum Natural History (Zoology), 28/5, 12-26. Kallio, Harri. 2005. The Dodo and Mauritius Island Imaginary Encounters. Dewi Lewis Publishing. The closest I could come to a single skeleton was Homo Floriensis, however this is only the most complete skeleton and it is partial. The Lb1 specimen has the skull, leg bones, hands, feet and other fragments. Due to the damp conditions they were not fossilised, but cannot be displayed due to their delicate structure (something like mashed potato). I know it’s not complete enough but I still think there is just about enough of it to make it worthy of a mention. You can also find more information about zoos, aquariums, and wildlife around the world at World Zoo Today. i have been interested in quaggas since childhood. i discovered today in a british wildlife magazine ( while sipping a latte at barnes & noble )that there are only 7 skeletons of the quagga known, the least of any known mammal. this is from the Grant Museum in london, which we have visited. ( some of darwin’s discoveries are there as well as pickled thylacines – it’s a dennis / paleo thing ). quaggas went extinct shortly after they were known to the West. there is only one photo, again from london in their zoo. another victim of human greed and violence.